The winter season snows on my senses. It lulls me into getting lax and lazy and not leaving the house. I was sucked into the Polar Vortex and vacated the local musical landscape. I was on a December decampment, a vortex vacation, a freezing furlough. 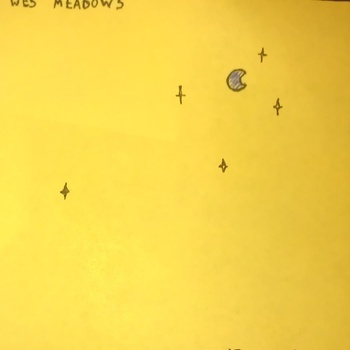 I’ve started my migration back to music thanks to Wes Meadow’s new release, “Blue Moon.” It catapulted me out of my cold coma and I landed face first into a soft pile of songs that I’m taking off my earmuffs to enjoy! A member of the local music scene already with the band All Over the Place,” and planted with Flowerpot Records, Wes also hosts a radio show on WXCU Radio, Capital University’s student-run radio station, in which he proudly promotes other local artists. Wes recorded his first EP in December 2009 and “Blue Moon” is a set of some songs that were scrapped since then, some songs that have been allowed on other albums and have been better tended to now, and some songs that were left off albums altogether. It even includes the very first song he ever wrote and recorded, “Breathe.” Taken from his “last 5 years of songwriting,” “Blue Moon” gives a home to songs that had nowhere to go, didn’t fit in, found themselves on the cutting room floor. “Blue Moon” is an animated album of “redos-and-rarities,” relate-able and exclusive. An offering of “odds and ends,” it comes together as a complete compilation. Seeing that some songs deserved a “second chance,” Wes supplemented some lyrics, played with the chord progressions, and brought them back to life. The fourth track, “Night Fishing,” was originally recorded in someone’s basement and included sounds from the video game that was also being played at the time, and the lyrics are salutes to some other bands that Wes has been influenced by. A musical mechanic, Wes managed to pick up the scraps, put the parts together, and make them work. “Blue Moon” is a good cure for the cold, a souvenir of songs, a most welcome snowflake!